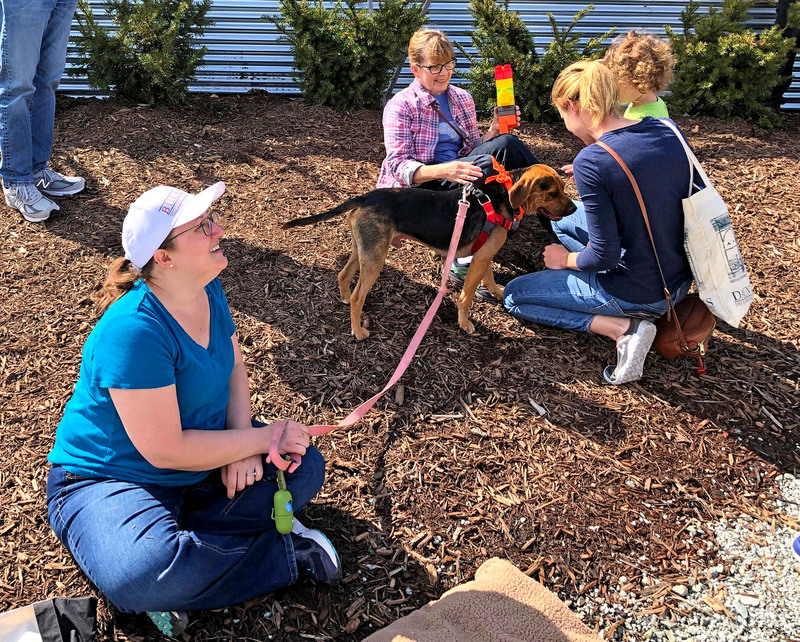 The sun shines down on the picturesque spring afternoon of April 6 at Durham’s Bull City Ciderworks, and Independent Animal Rescue (IAR) is gathering nine of its foster dogs for its latest adoption event. The outdoor space includes a deck and large grassy area. 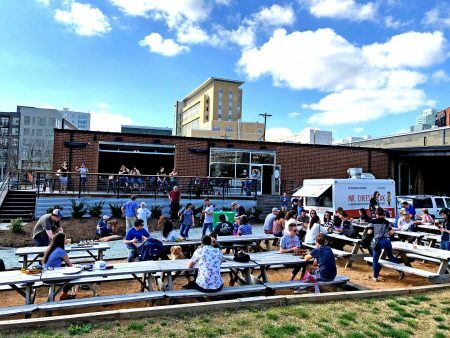 Dozens of Durham residents are spread out across picnic tables, donning sunglasses and sipping on cups of cider. Wes Schobel, the event coordinator and host for IAR, sets up a table with the organization’s banner, brochures and business cards. IAR is a Durham-based nonprofit organization that was founded in 1994. With the support of over 100 unpaid volunteers, the group works to rescue and provide safe care for animals in the community. A significant part of finding homes for these rescued animals is the adoption events that IAR hosts nearly every week. Ensuring that these events go off without a hitch is a big responsibility, but Schobel took it on as soon as he began volunteering in early 2014. When Schobel first started, he was hosting one event a month. Once he took over, he increased the events to nearly one per week and has now hosted more than 200 in total. Schobel spends most of the event drifting around the outdoor space, stopping to visit with each of the foster dogs and their parents. Schobel says he is a big dog lover, but doesn’t have one of his own at the moment. For him, part of the joy in hosting is getting to spend time with IAR’s dogs. One of these is Hagrid the Happy. The 8-month-old brown and tan pup sits next to a picnic table with Tamara Mueller and Jason Ast. Hagrid is not the couple’s own foster dog; they are taking over for the day while his foster owners are unavailable. This gesture is just one of many indicating the tight-knit nature of IAR’s foster group. Ast says there are plenty of ways to help IAR’s cause apart from taking on the responsibilities of fostering. Volunteers can take dogs to events or spend time with them outside during the day. “I’m going in on Tuesday to walk somebody else’s foster dog,” he says. For Esther Mack, IAR has given her the chance to form a relationship that otherwise would not be possible. 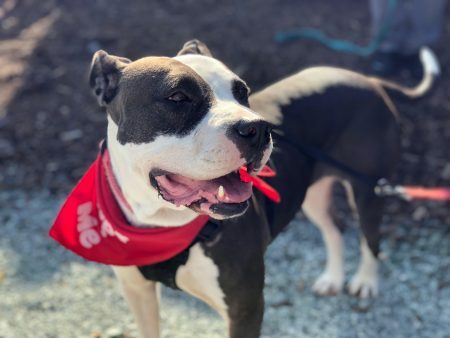 While Mack grew up with dogs and has been a dog person her entire life, she cannot currently afford to make the commitment required to owning one. Mack joined IAR in September and fostered a puppy for a short time, but is now only fostering a pit bull named Molly B. As the two sit together in the shade, Mack has nothing but praise for the work IAR does. Almost all of the customers at Bull City Ciderworks stop to pet and greet the foster dogs at the event. For Schobel, having people meet the dogs and learning about what these foster parents do for IAR is the most important part of events like these. “The biggest benefit is the exposure. A lot of it is just getting our name out there,” Schobel says. And the exposure for IAR benefits more than just the dogs that show up at an event. Johnny Sobczak, a UNC-CH junior majoring in journalism, is from Fayetteville. This semester he is serving as a staff writer for the Durham VOICE. This entry was posted in 2019, Community-building, Non-profits. Bookmark the permalink.